And increasing amount of women have been holding off on pregnancy to pursue other things in life first. In today’s day and age, more and more women are working towards personal goals such as their careers first. Starting a family has taken a backseat for many women and it really is no surprise why either. While it is great to secure financial stability and your place in your career first, the unfortunate news is that time can be of the essence. Once the time comes when you are ready to bring kids into the world, things can be a bit tricky. Especially if you are 35 years and over and trying to have a baby. The good news is, medical advances in the form of fertility blends can help combat the ticking clock. Today we will go over all the different fertility blends that can help you get the family you have been dreaming of. Not only will we include some of the leading fertility blends, but we will also cover some vitamins and minerals that are crucial to helping with your fertility. Finally, for couples who are looking more into a medical approach to fertility, we have listed some of the common medical interventions for your consideration. In the market for a fertility blend? Here are some of our top picks that will help you get on the path to a budding little family. This holistic fertility blend is an all natural approach to dealing with fertility issues. This multivitamin includes all the mineral dietary supplements that you could ever want in a good fertility blend. There is a slew of natural ingredients that encourage reproductive health. These ingredients include vitamins A, C, and E along with folate. Not only that, but there is a Chinese green tea extract that is known for its reproductive health benefits. Finally, what makes this fertility blend wonderful is that it contains great vitamins and minerals that promote healthy fetal growth for when you do get pregnant. Nature’s Plus includes DHA. DHA is imperative in helping support early stage uterine implantation as well as proper embryonic development. Finally, the cherry on top is that Nature’s Plus fertility blend is gluten free. If you are a conscious consumer who appreciates natural ingredients, then this fertility blend might be the best fit for you. This next fertility blend is perfect for anyone who is looking for an all natural fertility blend. Solaray’s vision is to provide a fertility blend that revolves around holistic principles. A primary holistic principle that drives this brand is that the use of a variety of different medicinal herbs working together is greater than any herb working alone. Some of the key ingredients in this fertility blend include buckthorn, kelp and saw palmetto. 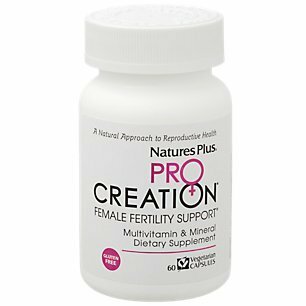 This proprietary fertility blend is perfect for anyone who is looking to try out a holistic approach. Another excellent fertility blend that you may want to introduce to your diet is the FertilAid fertility blend. This fertility blend contains key ingredients such as chaste berry, red clover blossom, Siberian chasing, and ginkgo biloba. These natural herbs are all key to combatting fertility issues. If you suffer from irregular cycles, endometriosis, and are over the age of thirty-five, this is a great fertility blend to start with. 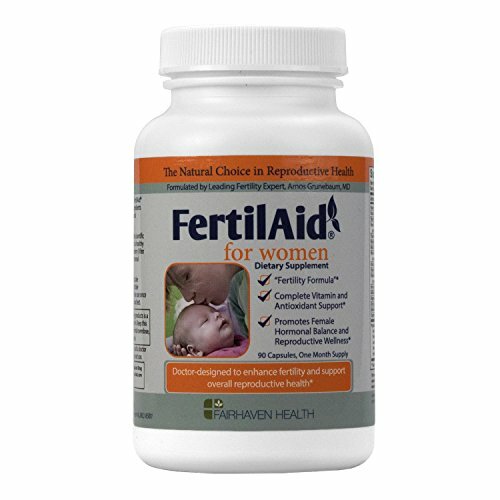 FertilAid helps with encouraging regular ovulation and balancing out your hormones. Not only that, but the vitamins and minerals included in FertilAid will help to improve your overall reproductive system. A TOP-SELLING FERTILITY PILL SINCE 2003. FertilAid has helped tens of thousands of couples to conceive. POWERFUL FERTILITY SUPPLEMENT + COMPLETE PRENATAL MULTIVITAMIN. Features a 2-in-1 formulation that provides you with proven herbal ingredients to regulate your cycle as well as a complete prenatal vitamin. IDEAL FOR IRREGULAR CYCLES. 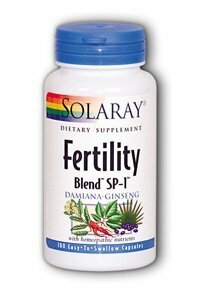 Contains a physician formulated fertility blend to stimulate and balance hormones that control ovulation. There are certain things that you should be looking for when you are shopping around for a fertility blend. Here are some of the essentials that you need to include in your diet when you are considering a fertility blend. A natural fertility blend is chaste berry (or vitex) as it is commonly known. This medicinal herb has been shown to enhance ovulation frequency. Not only that but because your hormonal balance will be improved, you are more likely to see an increase and consistency in your ovulation cycle. Along with that, the amino acid L arginine found in vitex helps encourage a healthy uterine lining. A healthy uterine lining is essential for proper implantation once you do become pregnant. Antioxidants can be a girl's best friend when it comes to fertility. Green tea, selenium, and vitamin E are all great antioxidants. These essential antioxidants help enhance reproductive health. They do this by helping repair damage brought on by aging and other environmental toxins. Get your reproductive system in tiptop shape by including antioxidants into your daily diet. Look for these in your fertility blend, and you will be that much closer to starting a family. Having the right vitamins in your system make for a great start to introducing children into the world. Be sure to take plenty of vitamin B6 and B12 as well as the minerals zinc and iron. All these vitamins and minerals are invaluable when you are trying to conceive. Not only that but they help to promote fertility health overall! Unlike natural fertility blends, this next type of fertility treatment is a little bit drastic. However, if you are suffering from infertility, this may be a route you will want to take. If you are struggling with getting pregnant, your doctor may prescribe a series of drugs that will help with fertilization. The first type of drug is clomiphene citrate or Clomid as it is commonly referred to. This drug will be prescribe if you are not ovulating regularly or are having issues with ovulating overall. What makes this drug unique is that it has the ability to block estrogen. Essentially, this drug encourage the hypothalamus and pituitary gland to release several hormones including GnRH, FSH, and LH. These different type of hormones react so that your ovaries can put out eggs, thus regulating or triggering your cycle. It is not uncommon for this drugs to be used in conjunction with other fertility treatment methods. For example, it’s common for artificial insemination to take place alongside using this drug. Another way to encourage ovulation is by injecting hormones into your body. This is another extreme method that your doctor may prescribe if natural fertility blends alone are not doing the trick. Unlike a pill, hormones will be injected into your system as opposed to swallowed via a pill. The doses of how much you will inject yourself with vary between the different drugs. However, the success rate is promising. Statistically, about half of the women who do start ovulating because of these drugs have a 50-50 chance in successfully fertilizing an egg. With all medical interventions, be sure to speak with your doctor about your needs and what the best fit for your body might be. While fertility blends might do the trick for some people, for others medical intervention may be the way to go. Fertility blends are on the rise and for a very good reason. You do not have to give up on your dream of having a family if you suffer from infertility. While time is a crucial factor in whether or not you will be able to provide a nurturing home for your baby to develop in, all is not lost. Try out some of these fertility blends and incorporate some dietary changes before and during your pregnancy. Use these tips and you should be well on your way to having a baby that you can welcome into the world.